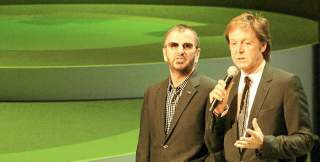 Prior to the appearance of Olivia, Yoko, Ringo and Paul, Microsoft presented the opening sequence of the Beatles:RockBand game on the big screen and there was also a Harmonix band present to play along with one of the melodies. This is a 10+ minute long video capturing that part of the press conference. We feature this as a link, because our column width does not support the width of the actual video.